The following salad is one of my "famous" family recipes. The origins of this salad are unknown, but it first came into my family via my Aunt who allegedly enjoyed it at a 1977 Pittsburgh Steelers Superbowl Party. If that's true, it might just be the best food ever served at a Superbowl Party. Everyone I have ever made this for has loved it, even the pickiest eaters out there. The way I make it is a little different from the original recipe, but it's good just the same. Caramelize the almonds in sugar. When they are caramelized, allow them to cool and then either break them apart with your hands or chop in a nut chopper. Note: we use the famous "slap-chop" now to chop apart the almonds. My mom breaks them apart with her hands, but my husband and I both find the process to be unpleasant. Plus, my husband prefers to have the almonds chopped into smaller pieces because he worries that otherwise someone might chip a tooth (this shouldn't really be a problem as the nuts are not that hard, but he is a dentist's son). 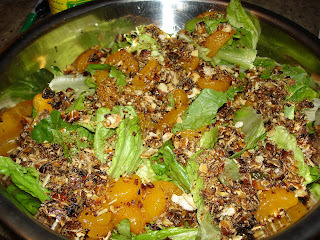 Top the salad with the almonds, mandarin oranges, celery and dressing and serve. The original dressing that my mom makes uses both parsley and sugar. I always forget the parsley, and purposefully leave out the sugar because it doesn't need it as there is plenty of sugar already in the caramelized almonds. This makes a great salad for any occasion, but is also perfect if you are planning to throw a Super Bowl party in January. Note: if you want the salad to last for two days, you should save the extra caramelized almonds in a Ziploc bag as they will un-caramelize if you leave them into the salad in your refrigerator for many hours. Sasha that looks great! 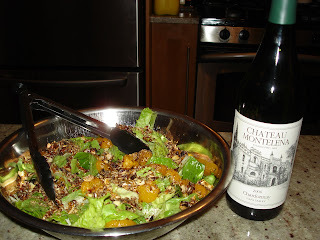 My mom does a similar salad which I have also adopted as my own. We just toast the almonds instead of caramelizing so I will have to try this out!